Thank you for your interest and welcome to Los Angeles Hoopz, LLC, America’s Favorite Basketball League and the best kept-secret for top competition. Follow the form below to complete your online application process. If any questions or concerns should arise feel free to contact us at info@losangeleshoopz.com for more information. Be sure to read to all the information carefully before making any submissions. 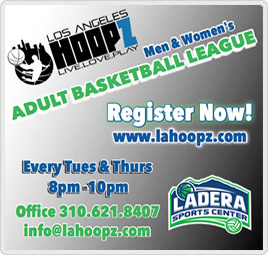 Be sure to checkout our Free Hoopz program that is offered to less fortunate individuals unable to meet financial obligations to Los Angeles Hoopz, LLC. Read carefully and complete the sign up form. All sales are final! Included with every team/player package are player and team profiles, stats, power rankings, commentary, league analysis, awards, standings, and the Hoopz Network. During registration be sure to indicate if you would like to purchase one of our Deluxe Hoopz Jerseys for an additional forty dollars ($40). Fill out the Hoopz Form where appropriate and register today spaces are limited! Check out the Blog or Hoopz Network for more information pertaining to Season Deadlines and Season Tip-Off! Would you like to donate $1 to help build the Hoopz Center [basketball facility]? You may register for multiple months. Uniforms cost $150 and are mandatory for first time players. Returning players that already have a uniform do not need to purchase another one. Teams must have a league approved jersey each game for participation. Team Referee fees are due at the beginning of each game. Note: Team Referee fees are due at the beginning of each game. The undersigned understands and acknowledges that the use of equipment and facilities provided by Los Angeles Hoopz, LLC and participation in their events (i.e., Intramural Sports) involves risk such as, but not limited to the following: risk of property damage, bodily injury, and possible death. These risks may result from the use of the requipment or facilities, from the activity itself, from the acts of others, organization of an act or from the unavailability of emergency medical care. The undersigned assumes all risks which are foreseeable and involved with or arise out of the equipment or facilities, the activity itself, the acts of others, omission of an act or the unavailability of emergency care, including but not limited to those risks factors described in Section 1 above. Exception being injuries caused by the sole or gross negligence, or willful or wanton misconduct on behalf of any officials, officers, employees, agents, or volunteers of Los Angeles Hoopz, LLC. I knowingly and freely assume all such risk, both known and unknown, even those arising from the negligent acts or omissions of others, and assume full responsibility for my participation. The undersigned acknowledges reading and knowing all policies and procedures relating to the activities, facilities, and/or equipment and understands that the safe and proper use of facilities, equipment or participation in the activity is dependent upon carefully following such policies and procedures. The undersigned releases Los Angeles Hoopz, LLC Basketball League, and all of their officers, trustees, employees, and agents not to initiate litigation on account of or in conjunction with any claims, causes of action, injuries, damage, cost of expenses arising out of the activity, including those based on death, bodily injury, or property damage whether or not caused by negligence or other fault of the parties being released. The undersigned waives the protection afforded by any statute or law in any jurisdiction whose purpose, substance and/or effect is to provide that a general release shall not extend to claims, material or otherwise which the person giving the release does not know or suspect to exist at the time of executing the release. This means, in part, that the undersigned is releasing unknown future claims. The undersigned, as a participant in the subject activity, hereby consents to medical treatment in a medical emergency where the undersigned is unable to consent to such treatment. The undersigned understands Los Angeles Hoopz, LLC does not carry participant insurance. The undersigned is encouraged to have a medical physical examination and purchase health insurance prior to any and all participation. I hereby authorize and give my full consent to Los Angeles Hoopz, LLC to copyright and/or publish any and all photographs, videotapes and/or film in which I appear while attending any sponsored. I further agree that Los Angeles Hoopz, LLC may transfer, use or cause to be used, these photographs, videotapes, or films for any exhibitions, public displays, publications, commercials, art and advertising purposes, and television programs without limitations or reservations. The undersigned has read and understands this agreement and realize it relates to surrendering and releasing valuable legal rights and does so freely and voluntarily. You will be taken to PayPal for payment once you click Submit.